Bullying is a serious and persistent issue in our schools today. Research shows that at least 30% of children are involved in school bullying as bully, victim, or bystander. Bullying can be defined as repeated exposure to negative actions by one or more persons, with the victim having difficulty defending himself. Bullying is aggressive, unwanted, involves a repetitive pattern of behavior and an imbalance of power. It can be verbal, physical, indirect (rumors, gossip), exclusive (leaving someone out) in nature and the bully may take property. Think carefully before reacting. Your instinctual response as a parent may be to jump immediately to action. Your child is suffering and you want to do all that is in your power to protect him or her. However, it is important to keep an emotional reaction in check, as it is not always helpful. Confronting the bully directly can backfire by inciting payback from the tormentor and fostering dependence in the victim. In many situations, the bullied child will have the best outcome if given the opportunity to be actively involved in the solution. Listening helps. This type of support can go a long way with your child and can reduce the sense of isolation he feels as a result of the bullying. The empathy can help reduce the pain and frustration a child that is being bullied may feel. Have the child recount to you exactly what has been happening, what it has been like for him, and how he has been reacting. Young children might have trouble articulating their experiences and feelings, but might be able to show you in play, with dolls, action figures or role play. Determine how serious the bullying is. How is your child's behavior affected? If your child is afraid to go to school, can't sleep or concentrate, is complaining of feeling sick or regressing, the situation is serious and contacting the school for help is suggested. Younger children may have more trouble articulating their struggles with a bully, so it may be useful to speak with a teacher or counselor to help assess what is occurring in the school. Try to understand why your child is being teased. In many situations victims believe they are getting teased for one reason or another: they are bad at sports, they wear glasses, they are late to develop, or classmates think they are ugly or stupid. In fact, many children have one or more of the above "afflictions" but do not get teased. Your child may believe she is being victimized for one reason, but it is really the reaction to the teasing that invites more taunting. The more upset the victim becomes, the greater the chance the abuse will continue. Speak with your child about her response to the bullying. Validate her feelings, empathize with how horrible the comments must have made her feel, but explain how it will benefit her to disguise or downplay her reaction in a confrontation with a bully. Help your child see that the more a bully sees her getting upset, the more enjoyable the experience will be for the bully and the bully likely will continue. Even if your child is not being bullied, the chances are he has witnessed bullying. Speak with your child about their experiences. What was it like to see someone being teased, excluded or hurt physically? How does it feel when they are teased themselves or (if they will admit it) when they may have bullied another child in some form. Discussion and role play can help prepare your child for future encounters as either a victim or a bystander. Empower your child. Develop a plan of action with your child that will prepare him or her for a possible encounter with a bully. This plan can include a discussion of what to say or not to say to the bully, which adults or peers to speak to if necessary and when to walk away. In some cases a child will respond aggressively to a bully's taunts, risking getting himself hurt and in trouble with the school. Parents can work with their children to identify their "danger zones" or things a bully might say that is likely to set them off. This will allow children to practice tolerating the comments and in some cases to have a good comeback handy. Many bullying situations are verbal and children can become less sensitive to name calling by discussing and/or playing interchanges out in a safe setting with a parent or therapist. Help your child develop methods to remain calm and shift the power balance. Review specific strategies, so that when he is confronted by a bully your child will be more prepared. Some young people I have worked with have found it helpful to envision an invisible wall between them and the bully. This helps them to visualize the bully's words bouncing off the wall, protecting them and limiting the amount of anger they display. Some children tell me that they let their minds wander into a daydream, telling themselves it is not worth their time to listen to the bully. I have also found it useful to have a child role play both the victim and the bully. It can help the child to pretend to think and act like the bully does. Gaining this understanding can change the dynamic and how he reacts in the situation. Children can also practice stock phrases, expressions, or moving away, so they will be prepared when a bully confronts them. Keep in mind that children may feel so ashamed about being the victim that they might not approach you. It is important to note any changes in your child's behavior, including irritability, difficulty concentrating, major changes in routine, appetite change or change in mood. Pay attention to complaints of physical symptoms such as headaches, stomach aches, and nausea, as well as new resistance to going to school in the morning. These symptoms are characteristic of anxiety and depression and might result from a stressful bullying situation. Recognize common traits of bullies. Bullies like to dominate others. They have trouble seeing situations from others' points of view. Bullies refuse to take responsibility for their actions. They blame and criticize to project their own sense of inadequacy toward others. Bullies crave attention and often cannot consider the consequences of their actions. They cannot tolerate differences, as these are considered to be inferior and not worthy of respect. Bullies feel entitled to isolate and humiliate individuals they do not respect. Learn about programs like CAPSLE. This stands for Creating a Peaceful School Learning Environment. 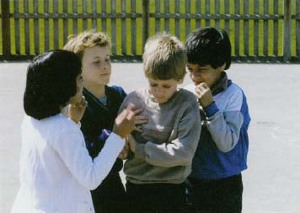 It is an intervention that focuses on the relationships among the victim, bully, and the bystander (including the teacher) during a conflict. All children and adults in a given school participate, helping to reduce stigma. The interaction of all three roles is studied and helps the school community work on understanding, rather than simply reacting. The aim of CAPSLE is to change the way bullying is viewed by the entire school system. To learn more click here. Some programs target only the bullies and the victims. You can speak with school officials, teachers or counselors and ask about the school's bullying policies and which interventions they use. Make sure your children understand that nobody has the right to physically hurt them under any circumstance. While many bullying incidents are verbal, there are times when the confrontation becomes physical. There is nothing that justifies physical violence toward your child. He has the right to feel safe in the school environment and if this is compromised action needs to be taken immediately. Speak with your child about your concern and let him know that he is not alone. Try speaking with the teacher first and if you are not confident that the situation is resolving you can involve the principal. Before you call, have all the facts written down, including what happened, who was involved, what the injuries were and time and date. It is also important to document any contact you have with school personnel. In the case of a physical or sexual assault, contact the police and file a report. You and your child can meet with a mental health professional who will help him to speak about the traumatic experience, offer support, and help him to feel safe in school. Ari E. Fox, LCSW provides child and adolescent psychotherapy with a specialty in school-related issues to individuals, families and groups in the New York metropolitan area.